Some things get better with age and some things, like car tyres don’t. Tyres aren’t wine… Our first in a series of reader-based tyre stories and advice. We’ve just given away $500 worth of tyres to one lucky winner. All you had to do was write in with your tyre experiences, and our team has picked the one we felt had the best lesson for others. But we’ve published most of the entries because there’s something in there for everyone. “Even though I had gone through a few sets of tyres on my old Mazda, the spare had been sitting in the boot since new – unused. We had the vehicle loaded up for our holiday up the coast, and of course I get a puncture up past Grafton. Unloaded the boot, put the spare on, reloaded. Back on the road with the light fading. The wife is still happy as we’ll make our destination before it’s too late. Murphy’s law ! Another flat ! Cursing, leads to more cursing when it’s the new spare gone down. Wife is unhappy big time. After an impromptu stopover for the night in a cockroach hotel in Ballina, the next day the tyre repairer said the spare tyre had perished and had cracks through it. PRACTICAL MOTORING SAYS: Spare tyres often live in the car, unused, for years. The ones stored inside the car are well protected, but even so degrade over time. Even worse are the spares mounted below the car which are much more exposed to the elements. Today’s cars often have space-saver spares so you can’t run the spare on the main wheels, it just has to sit there…slowly rotting. If your spare tyre is older than say six years, replace it. Often you can find a new wheel on eBay, and pick up a cheap tyre of the same size at your local tyre shop. “My story is not exciting but it does back up what you are saying about replacing tyres regularly regardless of wear. I bought the car of my dreams, a 2000 model Range Rover Vogue with every option possible. This is my retirement car and it was about (from memory) 6 years old and came with a genuine 25000km; I checked with previous owners after hassling the dealer. PRACTICAL MOTORING SAYS: Aside from offering little grip old tyres are far more likely to fail. Tyres are made up of different layers of compounds like rubber combined with carbon black and silica. There’s also steel belts running through the tyre. If those different layers and components come apart, and over time the bonds do weaken, then you are in a lot of trouble. PRACTICAL MOTORING SAYS: Exposing tyres to sunlight and general weather is a good way to damage them. People that run spares on the back of 4WDs are a prime case. It’s true I do exactly that, but my tyres wear out in 2 or 3 years, well before there’s a chance of exposure damage. “I own a 1971 MGB and considered myself pretty tyre savvy. These cars were originally equipped with 165/80×14 tyres and this size really suits the look of the car best. My car came to me with 185/70×14’s which had plenty of tread and two were actually new as they were required for the rwc. I had tried everywhere to see whether the “proper” size tyres were available new without success, however I managed to locate some (what I thought) reasonable second-hand tyres from one of the companies who import used tyres from Japan. As they were a matching set and pretty reasonably priced, I bought them to replace the ones which were on the car and thought that I had done the right thing. Unfortunately as the car doesn’t get a lot of use and may sit in the garage for several months between drives, these tyres didn’t prove to be the bargain that I was after. I guess it must have been about six months later when I was on my way up to the Sunshine Coast and had just entered the 100kmh zone when I heard the dreaded “bang” – fortunately I was driving in the left hand lane and managed to bring the car to a stop without causing any interference to the other traffic on the road. PRACTICAL MOTORING SAYS: Another classic case of a classic car and old tyres! Remember Paul Walker from Fast and Furious? He was killed in a high-performance Porsche that had lost control on…nine year old tyres. We’ll never know if he would have lived had the tyres been newer, but tyres that would would have been dangerous on a car that powerful. PRACTICAL MOTORING SAYS: Going to repeat that line because it’s so true – “Tyres are my first expenditure whenever I want to improve a car.” Spot on. Whether it is a 4WD, sportscar or roadcar there’s a better tyre out there and you can improve a combination of grip, noise, handling or strength – provided you realise you have to choose and can’t maximise all of them, but ensure your tyres are less than five years old. PRACTICAL MOTORING SAYS: We bet the car handled better with new tyres! From the year 2000 the way tyres were marked for date of manufacture changed. Even today it is hard to work out where the date is (see below) and it’s typically only marked on one side. How do you tell the age of a tyre? 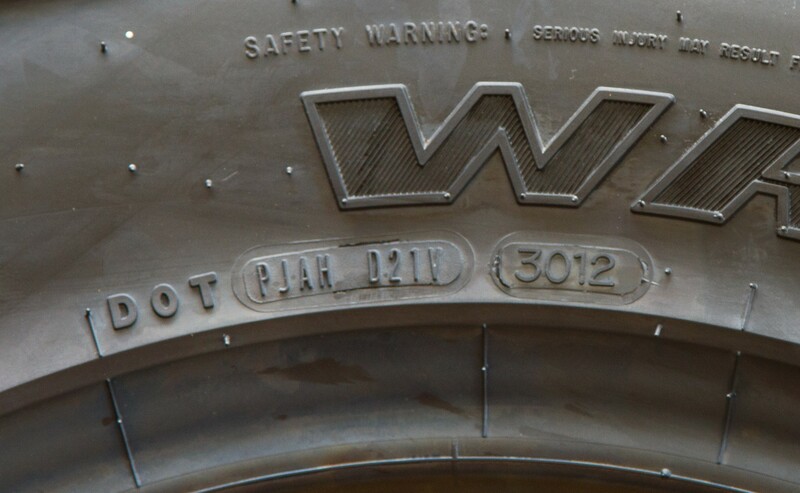 The first letters are to do with the plant the tyre was produced at, and last four digits are important. That means the tyre was manufactured in the 30th week of 2012. If you see DOT and then some other numbers and letters then take a look on the other side of the tyre as the information is not always on both sides, or choose another tyre if all four are the same age. Unfortunately, the tyre manufacturers do not make it easy for you. Tyres manufactured before 1999 had a different system but given that’s 15 years ago let’s hope none are still in service..but if you see three letters and a triangle then be wary! However, mere age is not the only indicator of a tyre’s roadworthiness. A well cared for tyre, stored in a cool, dry environment will last a lot longer than one that lives in harsh sunlight, extremes of temperature and moisture. So have a look for tiny cracks and splits around the tyre; compare with a new one. And if you have a drive of a car and it feels odd or unusual, find out why before you end up in trouble. How much tread should be left on a tyre before replacement? The legal limit is 1.5mm, but that assumes even wear across the tyre which is rarely the case, and ignores specific tyre designs. Each tyre has a wear indicator – look in the tread grooves and you’ll see occasional little “bridges” of rubber across the grooves of the tyre, usually all in a row. When the tyre tread wears down level with these bridges then it’s time to change the tyre, even if that’s before the legal limit. For example, 4WD all-terrain and mud tyres have much deeper tread blocks than roadcar tyres, and their performance falls away rapidly as the tread decreases so you wouldn’t ever run them down to 1.5mm – changing them at 20% of the tread depth remaining is a good move. What happens if my tyres or old or don’t have enough tread? Old tyres don’t grip and are prone to fall apart – read the stories above. Even new tyres can fall apart if they are run under-inflated as heat builds up which destroys the bonds between different layers or the tyre. If there’s not enough tread then you’ll have problems gripping the road, particuarly in the wet or on gravel, and you’re more likely to pick up a puncture. So when should my tyres be replaced? There is no exact rule other than “when their performance starts to fade”. But as a general guide, whenever they are more than five years old or worn, whichever comes first. Are part-worn, used, or second-hand tyres safe? What is a run-flat tyre and how do they work? I live near Katherine ,in the NT, and do high annual mileages, covering long distances regularly.. Since Goodyear stopped producing their ‘Grand Rally’ passenger tyres, which I used to use exclusively, almost all tyres that I have used have disintegrated.. often after being in service for only a few months.. Particularly if made by Bridgestone. One time I bought 6, fitted them to my wifes car, [2 spares], and on an interstate trip two disintegrated inside 200 ks, [that’s why we carry two spares], and another blew a week later. I then took the remaining three out of service. even though they were well within the 5 year period.. There is no warranty on Bridgestone products.. I could fill this page with more stories. I am only a customer, and the customer is always wrong.. I am now using Goodyear Cargo G26 light truck tyres on my passenger vehicles.. and I can actually wear them out.. might cost a little more, but money well spent.. Saves the mud flap and panel damage.. and I don’t always have to carry two spares..